48Th Ward Candidates step forward at last, time to debate NOW! The order is complete for the 48Th Ward Aldermanic Candidate list. I was happy to find a total of five candidates. In order of registration these are the following names, Patrick McDonough, Harry Osterman, Steven Cheraska, Jose E. Arteaga, and Philip Bernstein. I was in line at about 4 something and had ticket number 33 the first day of filing petitions. Remember that could change on December 1, 2010. I admit I was waiting for Philip to get on the ballot and I saw his name the last day, what a relief. Philip is going to improve the quality of the debates in the wards. Today, I called Philip and re-invited him over to my place and film a half an hour so people can get to know him better. Philip accepted. Philip is going to ask Michael Volpe again to host. Michael Volpe asked Harry, but Harry has intermediaries and will not return phone calls. I also want to invite Steven and Jose over for a free photo shoot and a half hour video to assist their campaign. The 48Th ward needs change and some debate on the issues a.s.a.p. I had a wonderful one plus hour at Columbia College and videotaped the event. I will post it soon. I spoke to the class on issues facing the City of Chicago and the 48Th Ward. I hope a stooge from the 48Th insiders do not challenge the candidates again, this is an insult to all of us. Let the debates begin, Patrick McDonough. I have been informed at least four City of Chicago contactors were asked to assist with Rahm Emanuel bid for Mayor of Chicago. One union has left the other Chicago unions to endorse Rahm. Members of Plumber’s Local 130 want James Sullivan dumped for again making decisions with-out member’s permission. These wild actions have caused massive problems with Chicago City workers losing benefits and millions of dollars of pay. The massive under funding of the Plumber’s Local 130 members working for the City of Chicago makes no sense. The Plumber’s Union should be watching out for the member’s retirement money. If you look at this picture, maybe you can see how unions get away with murder in Chicago. What does your comment have to do with the 48th ward and this article? Here’s what I have seen. Patrick, you are a bully. Philip, you are just a grumpy negative man, Harry, silly guy nothing negative, SO FAR. Steven, to new to access and the same with Jose. So, we don’t need a bully or a grumpy negative person running the 48th. We don’t need hateful blogs or personel agenda’s. I don’t see Harry having any of that and Steven & Jose don’t have an election website to see what they have in mind. There is enough dirty politics in the political world, we don’t need it in the 48th ward. Hint Hint! (Response) (Take your head out of the sand this election, we have problems and looking to the rainbow will not solve the foreclosure crisis. If you wish to join the 48th ward board please let me know) We need to grill the candidates this year) Thanks for the comments. Of the whole line-up, Philip Berstien amkes the most sense. If he will deliver on his direct views once in office, there may be hope for Chicago cess-poolitics. 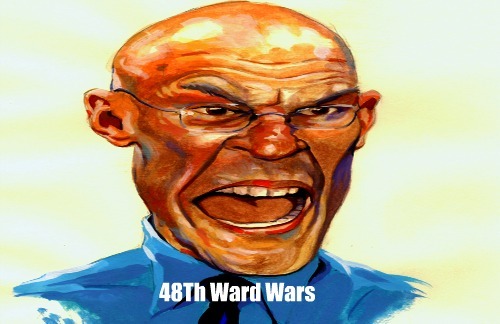 ChicagoClout: 48Th Ward Candidates step forward at last, time to debate NOW! Previous PostPrevious Please park your City Water Truck in the correct spot, not the TV News Parking. Next PostNext Did Michael Madigan and James Sullivan talk about pensions and unemployement?